Zhuyeqing tea is a Chinese green tea as well as a company trademark. The word Zhuyeqing can be translated into "Bamboo Leaf Green". Grown in Southwestern China's Mount Emei, Zhuyeqing tea is relatively young compared to other famous Chinese tea. It was discovered by Foreign Minister General Chen Yi in 1964. Impressed by its quality, he enquired about it. When told it hadn't had a name, General Chen proceeded to name it Zhuyeqing, because the leaves resemble bamboo shoots. I bought the tea from China in June 2007. It is not an authentic tea produced by the Zhuyeqing company. I was just curious how it tasted like. You see, while high grade greens generally looks good, teas that look good doesn't necessarily taste great. This is one example. 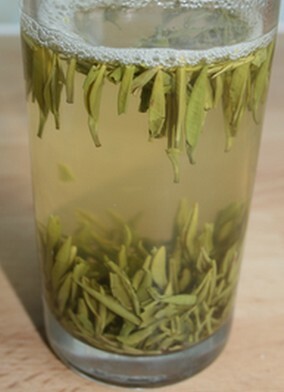 Looking at the single buds standing on their ends, hanging vertically at the top of the glass, you would think this is a great tea, won't you? Well, it actually tastes astringent and has none of the characteristics of a high grade. So what went wrong there? I can only speculate. Perhaps it is grown at low altitude? Perhaps the tea garden is low quality. Perhaps it is harvested in the summer, when the quality is lowest? Don't get me wrong. I am sure a real Bamboo green is worth trying. I just want to make the general point that external appearance can be deceiving when it comes to loose tea. Still, this is a picture to enjoy. Thank you for visiting. Please feel free to leave a comment. Doing research on Zhuyeqing as I am going to the factory with some of my students tomorrow. Right off the bat, the tea in your glass looks pretty bad. The Zhuyeqing we buy from the factory keeps its shape for quite awhile after all the tea has dropped to the bottom. Zhuyeqing is getting a reputation worldwide because it is so good. It is sweet, a bit grassy with a fantastic aftertaste. And it is also extremely refreshing. Of course, it is not cheap. The tea in the pic looks really bad and doesn't look like real Zhuyeqing at all. I just came back from China and bought some Zhuyeqing from the factory. Even the cheapest ones look much better than that and taste amazing. Too bad that you didn't get the real ones. I recently received a tea as gift from a Colleague in China. It was one of the best ones I have tried. Looking into it, I discovered it was a green jasmine Zhuyeqing tea. The leaves look to my untrained eyes like yours, but the taste is not astrigent. Now I need to find a way to buy it in the SF Bay area. Some good friends from Chengdu gave this to me for Christmas. They love it and so do I. Drinking some right now and it is delicious, and in grand Chinese style it can be re-brewed many times. I usually get two days out of a batch, 2-3 steeps a day. It virtually all sinks, no floaties to spit out, even on the first steep.